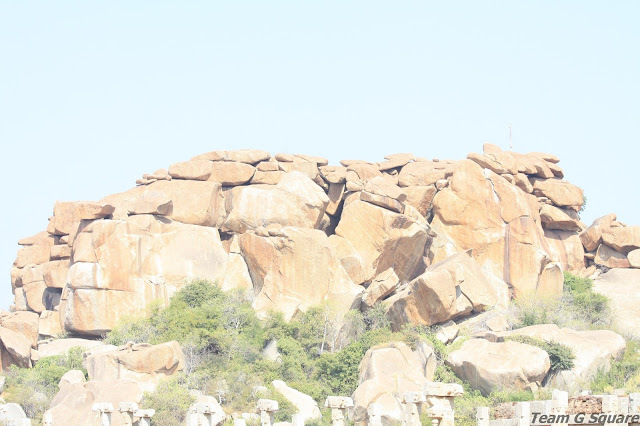 "Such a place does not exist here, I have been working here for the past thirty years and never have I heard of a hill named Mosalayyana Gudda", these were the words of a lady in response to the query of the whereabouts of Mosalayyana Gudda (Gudda-Hill)! These words were totally out of sync with the book I was referring to with regards to Mosalayyana Gudda. 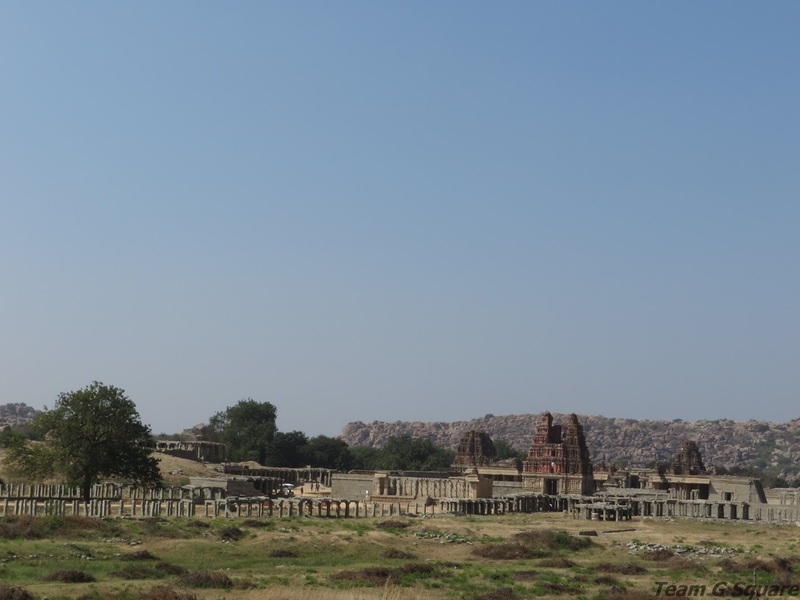 My friend gave me a puzzled look after which we decided to continue towards the much known Vijaya Vittala temple. Surprisingly, the information board put up opposite the temple entrance gave us the exact location of the hill we were in search of! Wasting no time, we walked curiously towards the hill and reached its base. 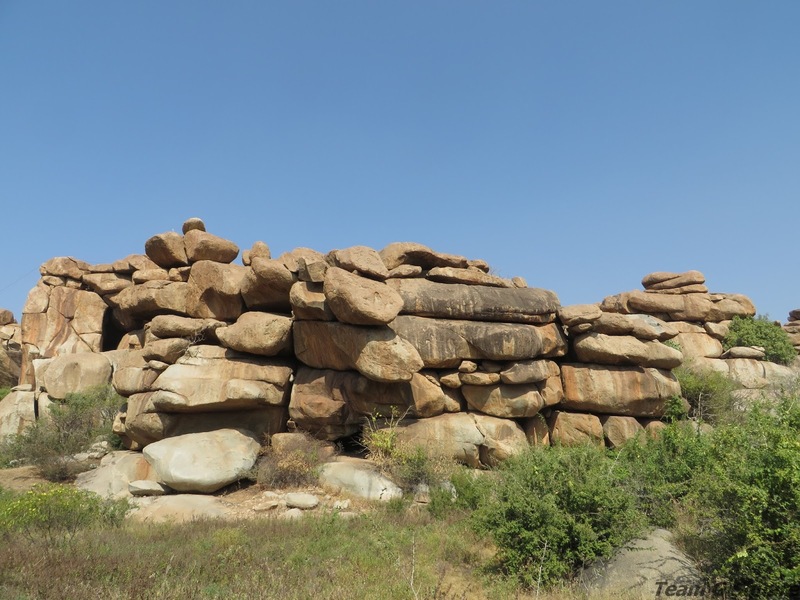 While we were anxious about finding the cave paintings, a local shepherd boy came to our rescue and confirmed about the presence of paintings on a few rocks. After further discussion with him, we realized we were close to the site of cave paintings. The boy was bound to his duty of taking care of sheep and hence was unable to guide us to the caves personally. 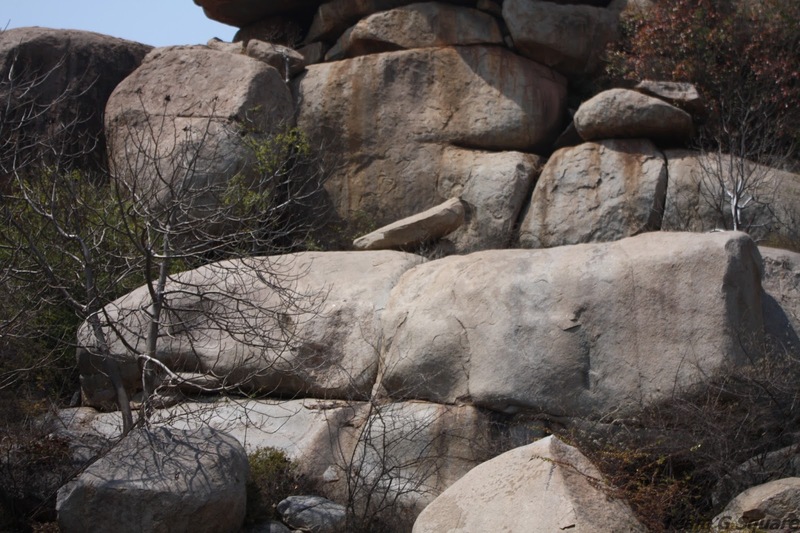 We thanked him and as we climbed the hill, we began to examine every rock that we came across for paintings. We looked around for quite sometime, yet there were no signs of any paintings. Walking along, we reached a reasonably plain stretch of land surrounded by heaps of rock, making it difficult to find the cave paintings. After a small break, our hunt continued. While we checked every rock carefully, a red color paint on the rock caught our eye and we reached that pile of rock straight away and eureka! We had found it. There they were! 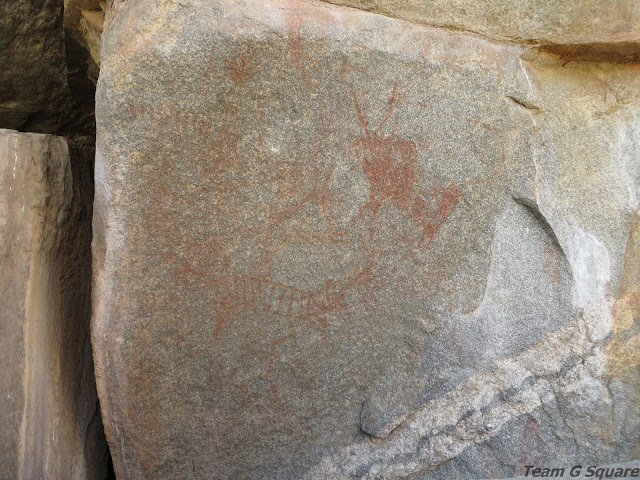 We had to climb a big boulder to have a closer look at the paintings. We were so thrilled and my friend admitted that he had never seen anything like this before. 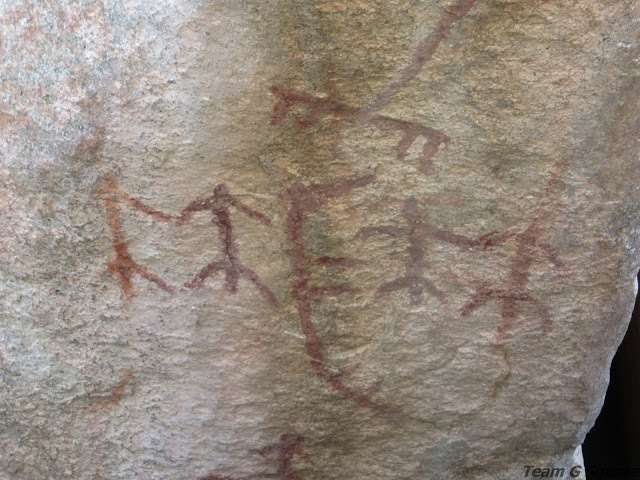 We carefully examined the cave paintings and spent a good time admiring the skills of the pre-historic people. I revisited this site with my wife and four of my best friends. 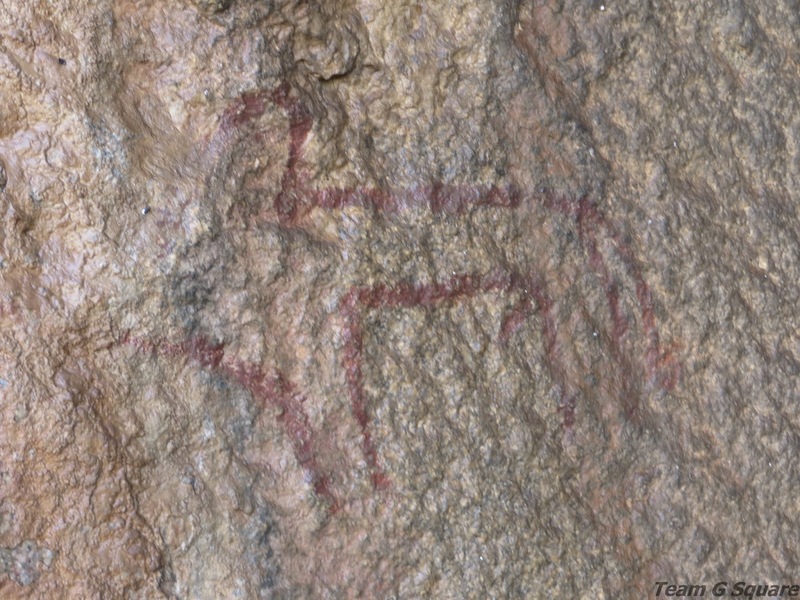 Everybody was equally excited to witness these pre-historic paintings. Further climb led us to the peak of the hill from where the views were amazing, giving us a chance to click some great shots. Another amazing place and your country does have so many wonderful, ancient places! I am in awe of all the beauty and history!! Wish I could visit there myself!! Fortunately, your terrific captures are the next best thing!! Thank you SO much for sharing with us!!! Hope your weekend is going well! Enjoy! how wonderful! 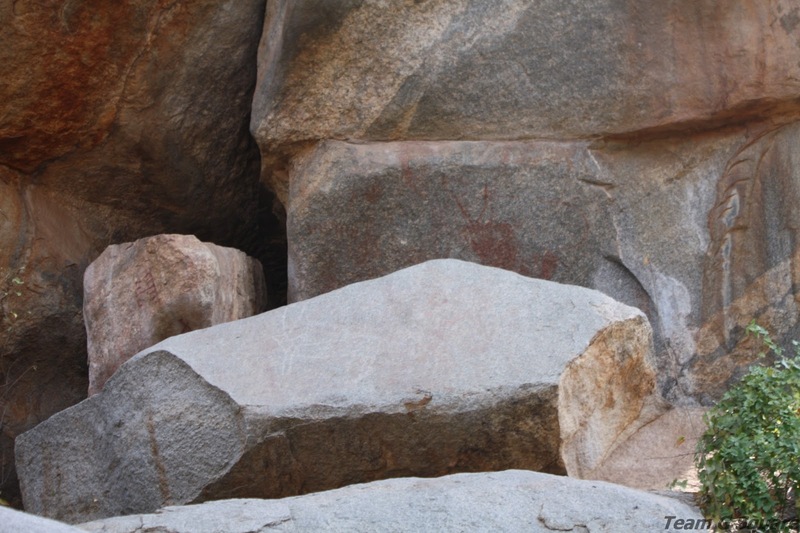 the rocks themselves are incredible, but then the ancient paintings are treasures. What an amazing site! thanks for sharing. It's a very beautiful place to explore. I wish I could go hiking here!! Hampi is indeed a very beautiful place! Lovely post..
A lovely place to explore.